You can learn to make your own homemade cough drops and avoid the toxic ingredients in the over the counter (OTC) medicines.Whether you're raiding the pantry looking for relief or an experienced herbalist, you can make these easy, all-natural throat soothing cough lozenges in just a few minutes – without any special tools. It is helpful to have a dehydrator for quick, uniform drying, but you can also use the oven with the light on for gentle heat. There are many recipes that heat ingredients to the hard crack stage to make a candy-like cough drop. I do not recommend making any herbal cough drops using this hard candy method. Extreme heat damages the herbs so they lose their nutrient content and are basically rendered useless. Even heating honey to 160°F or above causes rapid degradation and decay. Remember, anything strong enough to act as medicine may cause side effects and interfere with prescription medicines. Tell your doctor and your pharmacist before taking any medications. Because these drops contain raw honey, do not use for children under 2 years of age. What's Wrong with Commercial Cough Medicine? As noted above, if you're using a hard candy style herbal cough drop, you're not getting the maximum benefit out of the herbs. 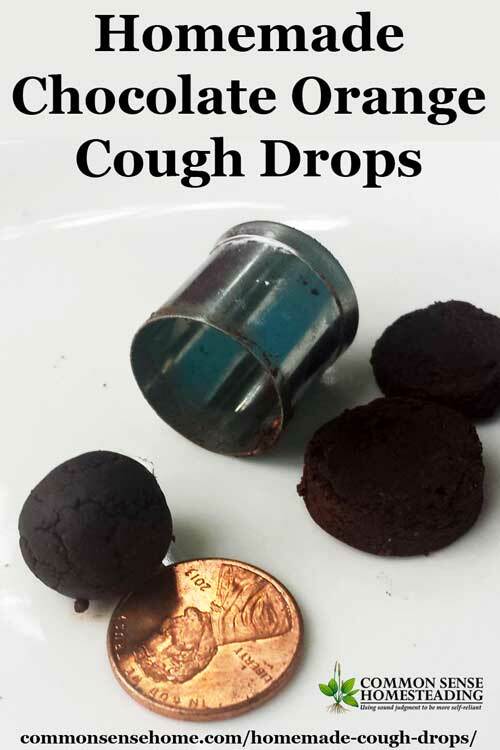 Dark chocolate fans will love these herbal cough lozenges made with common pantry items. Cocoa doesn't just taste good, it contains Iron, Magnesium, Copper, Manganese, Potassium, Phosphorus, Zinc, Selenium, Polyphenols, Flavanols and Catechins. Honey possesses antiseptic and antibacterial properties. In medical studies, honey surpasses dextromethorphan and diphenhydramine as cough suppressants. Vitamin C is an important vitamin and antioxidant that the body uses to keep you strong and healthy. Vitamin C is used in the maintenance of bones, muscle, and blood vessels. Vitamin C also assists in the formation of collagen and helps the body absorb iron. Bring water to boil and pour over tea bags and let steep until cool. Gently squeeze the water out of tea bags and reserve 2 tablespoons of tea. Mix together 2 tablespoons of tea, honey, cinnamon, ginger and orange zest. Add ¼ cup of cocoa or carob powder and mix. Add remaining cocoa powder 1 tablespoon, blending well after each addition. Continue until you can squeeze the dough in your hand and it keeps its shape. Form dough into small balls about ½” in diameter and place on cutting board. Press dough balls with your thumb and flatten out until about ¼” thick. Place lozenges in dehydrator at 95°F or in oven with oven light on. Dehydrate until completely dry. Store in airtight container, use as needed. Choose your herbs from the list below. Make your herbal decoction or infusion, cool and reserve 2 tablespoons of the resulting liquid. Mix 2 Tablespoons of herbal liquid, honey, and orange zest. Add ¼ cup of slippery elm powder and powdered herbs and mix until well blended. Note: Reduce amount of slippery elm powder by one teaspoon for every teaspoon of powdered herb you add to your recipe. Add remaining slippery elm 1 tablespoon at a time, blending well after each addition. Continue until you can squeeze the dough in your hand and it keeps its shape. Form dough into small balls about ½” in diameter by rolling in your hands and place on cutting board. 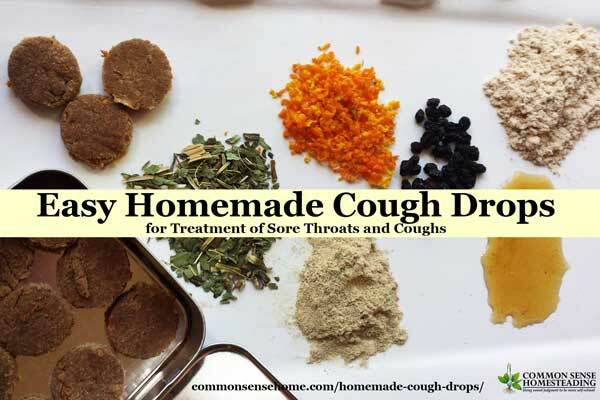 Every ingredient you use in your homemade cough and sore throat drops should serve a specific purpose. Herbs and spices produce actions in our bodies when we ingest them; understanding their actions will help us custom make lozenges that will treat our specific needs. If you have a dry cough you will want to take something that will include an expectorant. If your cough is keeping you up at night you will want to add an herb that aids in sleep as well. After you have chosen your herbs, you need to make an herbal infusion or an herbal decoction. Infusions and decoctions are different ways to get the good stuff from your herbs into water. 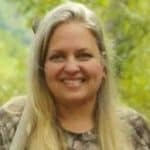 Leaf herbs or flowers work better with the infusion method and roots, berries, barks and seeds work best with a decoction. Slippery Elm is a Demulcent, Emollient, Expectorant, Diuretic, nutritive and mucilaginous herb with properties similar to comfrey. Elderberries contain flavonoids, are antioxidants, antiviral, anti-inflammatory, antiviral, anti-influenza, and anticancer properties. Chemicals in the berries help reduce swelling in mucous membranes and relieve nasal congestion. Wild Cherry Root is analgesic, antibacterial, anti-constrictive, anti-inflammatory, and relaxing to the muscles. The bark is ½% hydrogen cyanide, just enough to stop the coughing and to relax the bronchial tubes. Cinnamon is a potent antioxidant, antifungal, antibacterial and is used to treat coughing and sore throats. Ginger is an antiseptic, decongestant, antiviral, anti-inflammatory, antihistamine, decongestant and a natural pain reliever. It contains chemicals called sesquiterpenes which are specifically used to target rhinoviruses (the most common family of cold viruses). Licorice is an anti-inflammatory, expectorant, soothing to gastric mucous membranes, cooling, and antiviral. Echinacea contains active substances that boost immune function, relieve pain, reduce inflammation, and have hormonal, antiviral, and antioxidant effects. Emollient, contains polysaccharides that have antitussive, mucilaginous, and properties. Because of this, marshmallow has a soothing effect on inflamed membranes in the mouth and throat when ingested orally, specifically sore throat. The antitussive properties help reduce dry coughing. Hot infusions draw out vitamins, enzymes, and aromatic volatile oils from leaves and flowers. A few good herbs for hot infusions include Chamomile, Holy Basil, Ginger, Nettle, Peppermint, and Skullcap. Decoctions are simmered teas that are perfect for the extraction of hard roots, dried berries, barks, and seeds. Longer brewing time is needed to extract the medicinal compounds from these tougher plant materials. Place 3 tablespoons of dried herb into a small sauce pan. Strain the herb and reserve the tea in a quart jar. Pour additional hot water back through the herb in the strainer to fill your jar. 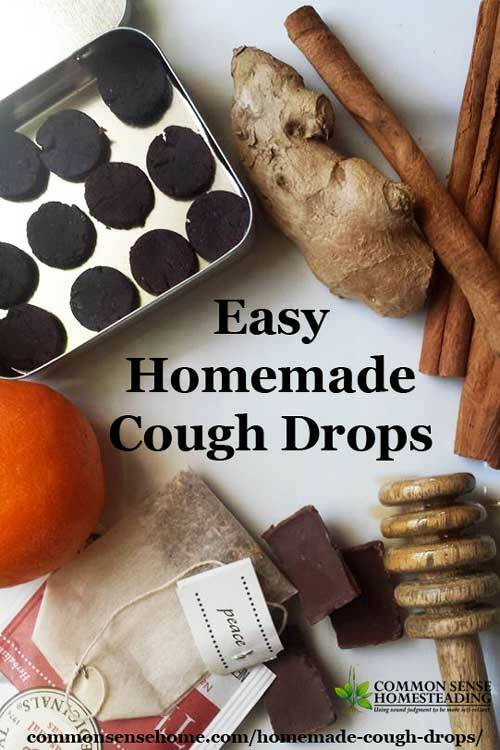 I hope you give these homemade cough drops a try and that you find them as helpful as our family does. Do you have any cough and cold care tips? Leave a comment below. These are great recipes. I have shied away from making cough drops due to the “hard candy” method. Not great at making it, and as mentioned, it destroys many of the healing properties of many herbs and honey. Thank you for the alternate method!! !